“Banana Island Ghost” is about a young man named Patrick (Diabuah) who dies, but is scared to step into Heaven because he does not have a soulmate. He is given three days by God (Bimbo Manuel) to find a lady and get her to love him. Patrick has the luxury of being unseen or unheard by anyone except the lady he chooses, and he requests for a lady who lives in Banana Island. He ends up waking next to Ijeoma (Chigul), a plus-size lady who is about to lose her father’s house unless she can raise 18 million naira in three days. She takes to combining her 9-5 with a gig as a mascot and pilfering of gadgets, amidst the looming purchase of the house by a certain Mr. King (Nuhu) and her self-esteem issues. One lovely thing about the movie is the choice of music put to use. Viewers would have their ears treated to Bez’s “Over You”, the lovely Ruby Gyang’s “Kale Ni”, Ill Bliss’ “Bank Alert”, amongst others. If this movie were to have an O. S. T, I would definitely go on to buy it. The movie also scores high in mischief value. 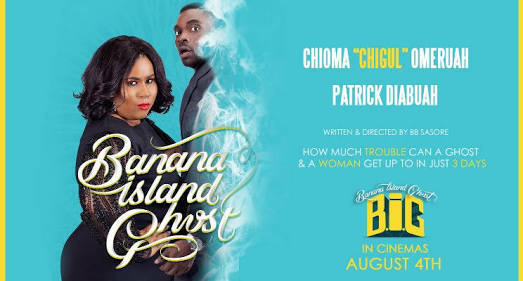 In Banana Island Ghost, we see Patrick, the male lead, use his ghostly nature to his advantage, from freely changing his wardrobe at The Palms, spiking the drink of Ijeoma’s cheating boyfriend with laxatives, scaring a lady by “scooping her Coldstone mid-air”, and spraying fire extinguisher on the hair of Ijeoma’s mean colleagues. He also assists Ijeoma in giving the impression that her car is A. I – operated at a charity event. However, that’s all there is to this movie. From her acting, it is clear that Chigul is better off with her comedy skits. She has no place in feature films, with her forced and mechanical acting, and her tendency to change accents with every other scene. Her attempts at humour were pretty much 50-50, and this performance is anything but memorable. Bimbo Manuel may not exactly be a Morgan Freeman, but he pulled off his omniscient character, even indulging in some mischief as he blurred Adegbite’s full nakedness from Patrick’s view. The same cannot be said for Saheed Balogun and Ali Nuhu; both darlings in their respective indigenous movie circles, the two actors did next to nothing here, and were a waste of screen time. It would be laughable to add this movie to their videographies, if you ask me. Much is made about Nollywood’s improved cinematography, but a number of scenes left much to be desired. The bus scene where Patrick flings a passenger’s phone out of the window as a ghost culminates in the most artificial bus scuffle I have ever seen, and in the scene where Ijeoma sings at a charity event, there is just something plastic about the guests in attendance. The script falls short too. At the end, Ijeoma has the chance to win 20 million naira by participating in a poker tournament…organised by the very man who wants to buy her father’s house! How cliché can we get? The part involving the policemen is dragged on for too long as well, to the point that the humour wears off and the jokes becomes annoying. The point of self-realization on Ijeoma’s part, and Patrick finally being able to love, is a bit cheesy too. Banana Island Ghost is a movie that cinema lovers are not advised to go for with high hopes. It has its good points, but it is ultimately another disappointing “boutique” movie. I want a refund of the money for my ticket, and the ticket purchased for my date.